No Easy Beads: "A Sea of Memories"
Snakeskin Jasper stones surrounded by an assortment of Keshi and coin pearls. Swarovski pearls unite the components. The finishing touch uses antique bronze chain to bring a contemporary look to the design. Beautiful! 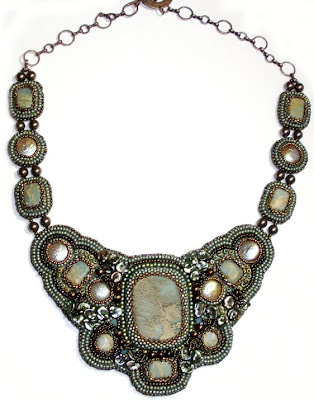 I love how the stones move up the piece and then the pattern gets followed through in the chain. Thank you for the kind words Lisa, Summer and LeAnn. I started this piece Oct 2008. I had to dig deep to the original post called building components. I was inspired by my time on the sea to come home and finish it. Filled with memories everything came together. crazy gorgeous!!! i LOVE it!!! Bev, you are an artist! This is unbelievable!!! Fantastic work, Bev! I so admire what you do with the beads! Beautiful colors and design! Looks comfortable to wear! Truly amazing! You do lovely work!